Are you making your first visit to Telluride? Trying to figure out which of the many Telluride rentals we offer is the perfect getaway for you and your family? Did you know that Telluride is essentially two towns? Our little hamlet is actually divided into two distinct areas, linked together by a fun, FREE gondola ride with the MOST AMAZING scenery in Colorado. There is the actual town of Telluride and there is also the town of Mountain Village. Latitude 38 manages gorgeous properties in both of these areas. Each of these unique Colorado ski towns have their own special perks and advantages, depending on what you are looking for during your stay. When choosing from one of the many luxury Telluride rentals we offer, ask yourself if you would you prefer a more private, log-cabin style home with plenty of space for the entire family to spread out and makes themselves at home? 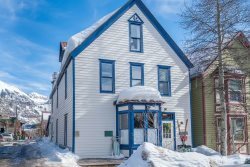 Or, would you love to stay in a charming, historic mountain town home with tons of character? If you answered the former, you probably would prefer a stay in Mountain Village. Mountain Village is a fairly new municipality, having been incorporated in 1995, that has the feel of a resort community. Many of the spacious homes and condos in Mountain Village are newly built. Most of these properties have a very modern yet western motif with loads of room for the entire family to enjoy. If you answered the latter, the Town of Telluride is your scene. Telluride is busy year round with festivals, activities, arts, restaurants, shopping, restaurants and nightlife. If you enjoy the history of the town, beautiful homes, new condos, being close to downtown, and nightlife, then this may be the choice for you. When visiting Telluride, would you prefer to ski out of your Telluride rental property’s back door straight onto the adjacent run? Thinking of bringing your young kids to indoctrinate them with a life-long snow obsession? We have many slope side ski-in/ski-out properties that make skiing with little ones as easy as possible. With the runs being so close, there is no need to haul your heavy equipment all over the place, making it easy for the young ones to get around. Glide out of your door in the morning and be shooting down the slopes before most folks are even awake. During your visit, is your priority to get first tracks and ski until the lifts close and then spend the evening cooking dinner together in your home away from home? The gondola from Telluride stops running at midnight, so you need to be all snuggled in at a reasonable time in Mountain Village every night. There are many fine restaurant choices in Mountain Village, but most of our fabulous rental properties have great modern kitchens to prepare your own memorable meals together as a family. Maybe your idea of a perfect ski day to start out with a hot coffee from the local bohemian coffee house and meander your way towards the nearby chair lift or gondola? Are you more likely to seek out unique or gourmet dining options, funky mountain town culture, eclectic dining choices and a festive nightlife, that will keep you out late? Telluride is the perfect destination for you. Regardless of your individual preference, you can’t go wrong booking a vacation in either Telluride or Mountain Village. Both areas have stunning scenery and offer world class skiing and amenities. Telluride and Mountain Village are both home to many events, festivals and celebrations all year round. Both are four-season vacation destinations with fun and adventure for everyone no matter what time of year. There are die-hard Mountain Village vacationers and there are those who will only stay in town. You are sure to have an amazing experience either way. When you call us, please let us know about your plans while you are here and the various ages of your group. We are happy to help you find the perfect property from our wide choice of Telluride rentals; the one that is sure to make your ski-vacation wishes all come true.